The picture above is from 1962 and reflects a life long connection to the Chevrolet Corvair which was built from 1960 to 1969. The little guy pictured is actually me at 1 years old. Joe’s Corvair Garage is a reference to myself, my Father (Joe Sr.) and our family as we have shared this hobby since I was old enough to recognize General Motors products. My Father worked for 45 years in various capacities for Dueck GM in Vancouver, British Columbia which was always one of the top GM dealers in Canada. We were always ‘car guys’ and with my brother and my cousins, and now with my son, we have pursued this passion over the years. Our first step into Corvairs came as I approached the driving age in 1975 and I was pushing Dad to do a restoration with me. We actually first started out looking for a Chevy Nomad, but during our search we came apon a 1967 Corvair 500 Coupe which Dad thought would be just perfect for my Mom to drive. 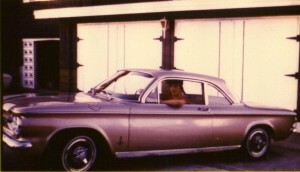 Shortly after the 1967 arrived I bought my first car, a 1962 Monza 4 speed Coupe with 38,000 miles. I still have this car, now with 44,000 miles. This site is intended to form a record of our journey with Cars… mostly Corvairs.